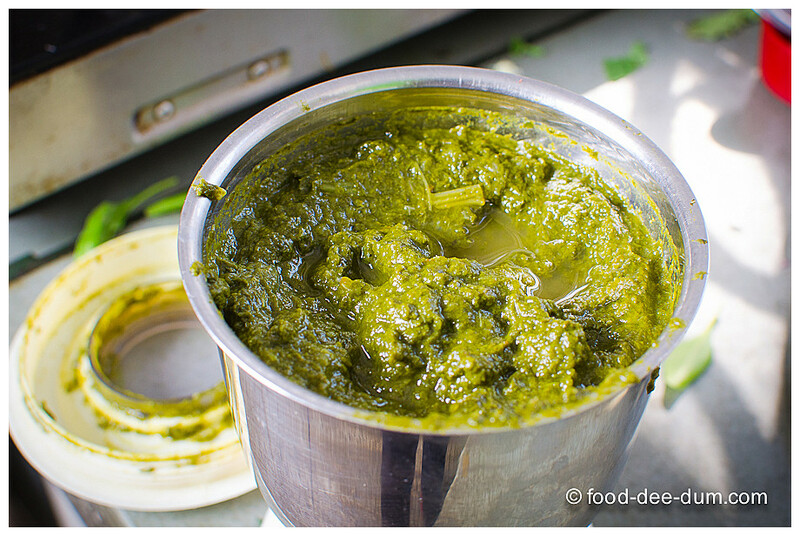 Or, you know Delhi winter is truly here when saag makes an appearance in your kitchen! 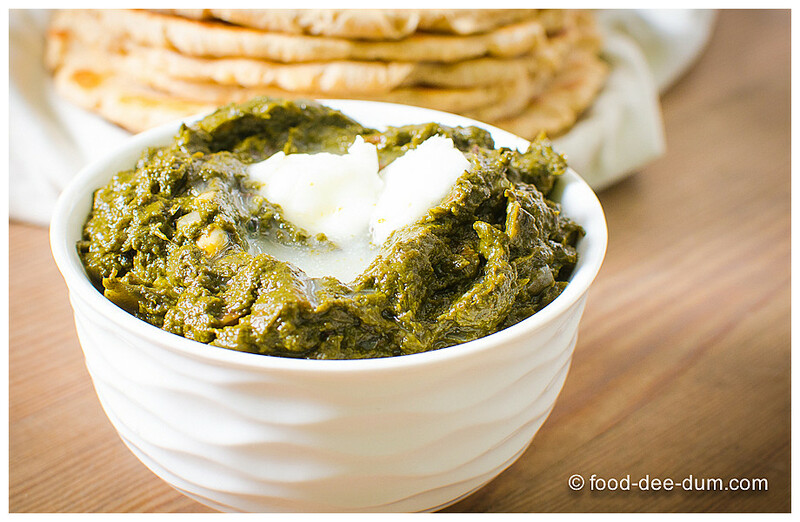 Sarson ka Saag is one of those age-old favourites that we wait all year for. 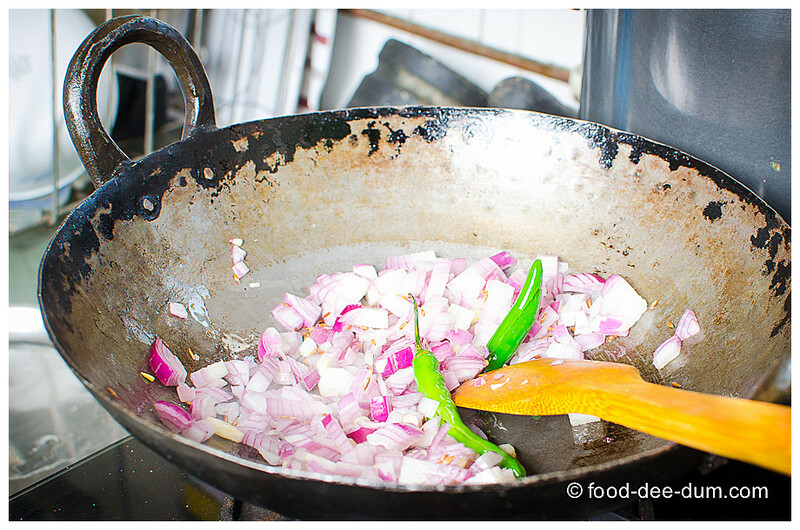 It’s the specialty that we ask for when we travel through dhabas in Punjab and Haryana. It’s the final product of those beautiful yellow and green fields we see travelling anywhere on the highway in the North & North-West of India (think Dilwale Dulhaniya Le Jaayenge and SRK+Kajol reunion). On an irrelevant aside, I have 1-2 forgettable pictures in mustard fields but getting the-best-profile-picture-ever-in-a-mustard-field is definitely on my list of must-have photos! Ha! 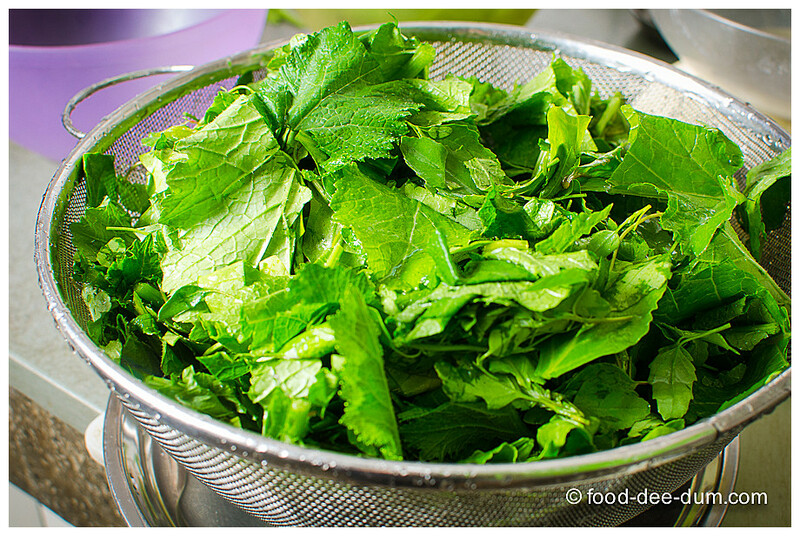 In my mom’s house, this saag is a (winter) treat, to be had with makki-ki-roti (cornmeal & radish rotis). 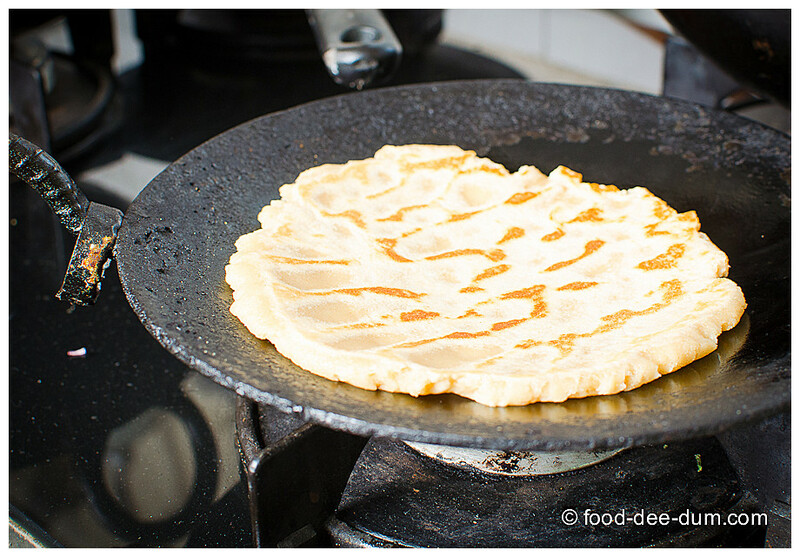 Except on one occasion, Kartik Purnima or Gurupurab, when we have it with meethi roti (sweet roti). We keep a fast on this day for the longevity and well being of our husbands, much like Karva Chauth but with less fanfare. 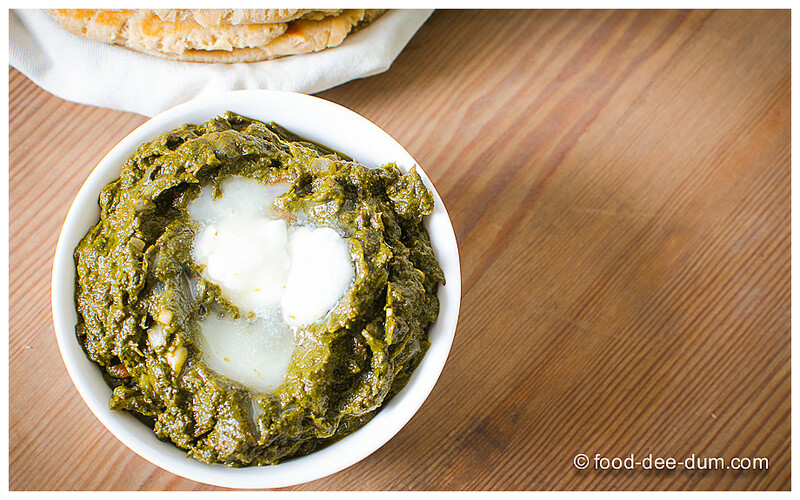 The meethi roti is part of the breaking-the-fast ritual and we dig in to a pot full of saag with this roti after. Topped with (very) generous dollops of home-made white butter, of course. 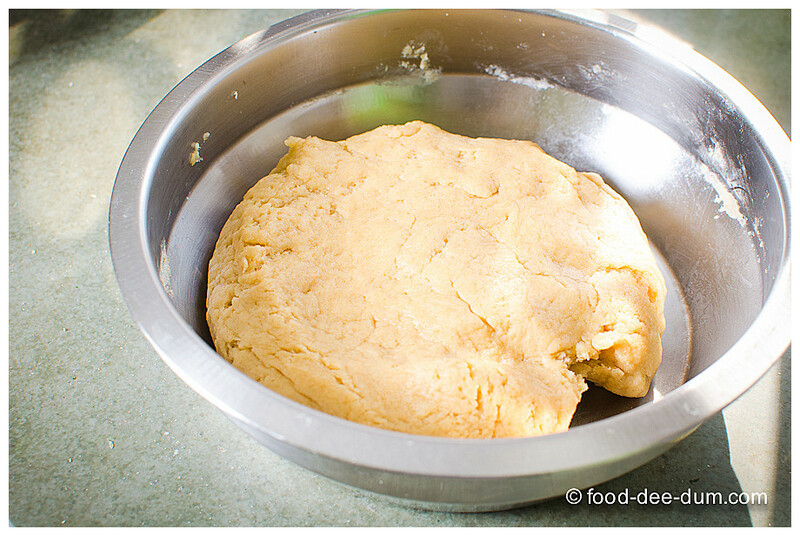 The meethi roti is almost like a biscuit and I have a mind to try it again using biscuit cutters and the oven. Will keep you posted when I do. 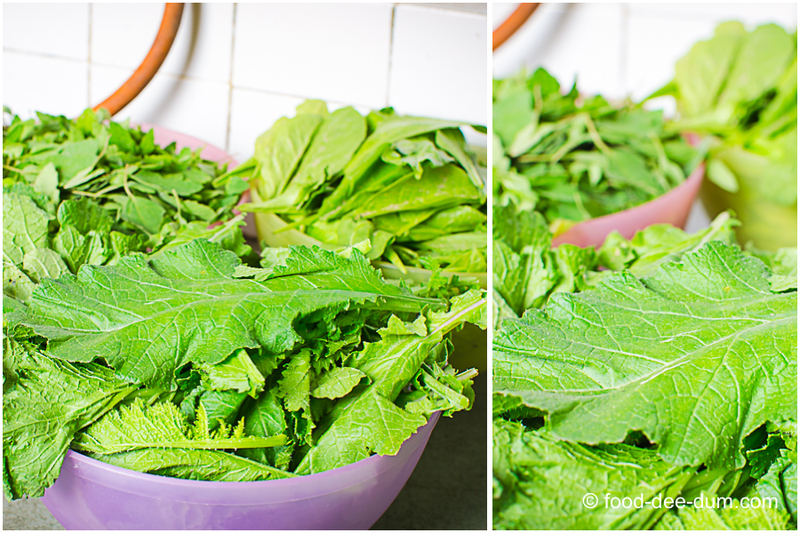 Weighed and cleaned the greens — saag, palak & bathua. 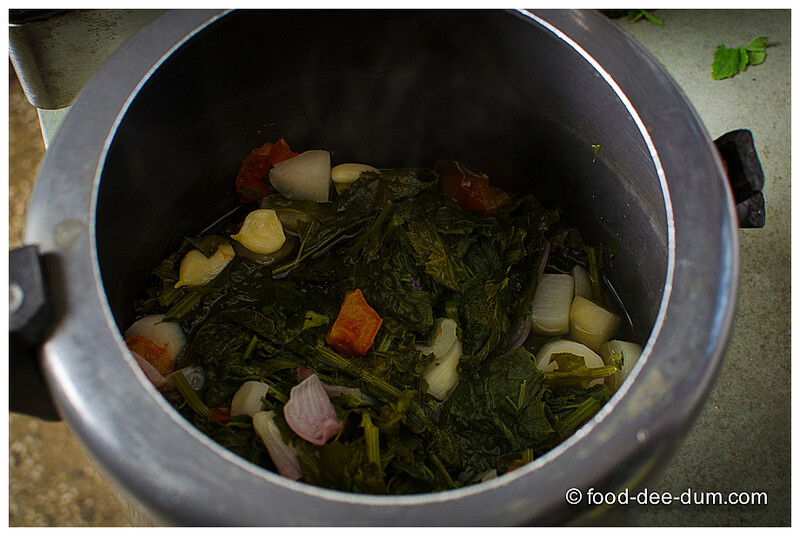 I chopped these up roughly and washed them – more from the perspective of fitting them in the pressure cooker than the need to break them down. 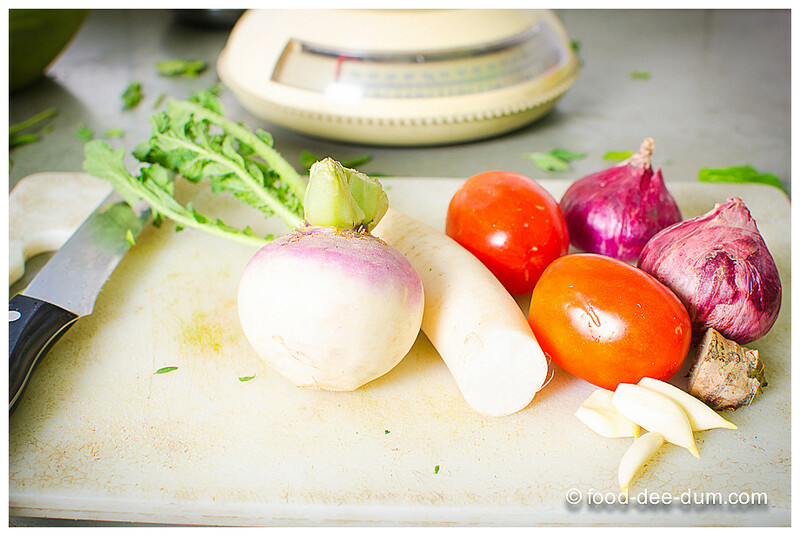 Next I roughly chopped up the mooli, shalgam, onions, tomatoes, ginger and garlic. Then I placed all the above in a pressure cooker along with 1/2 tsp salt and a splash of water and set it to cook for 3 whistles at full pressure/ high heat. 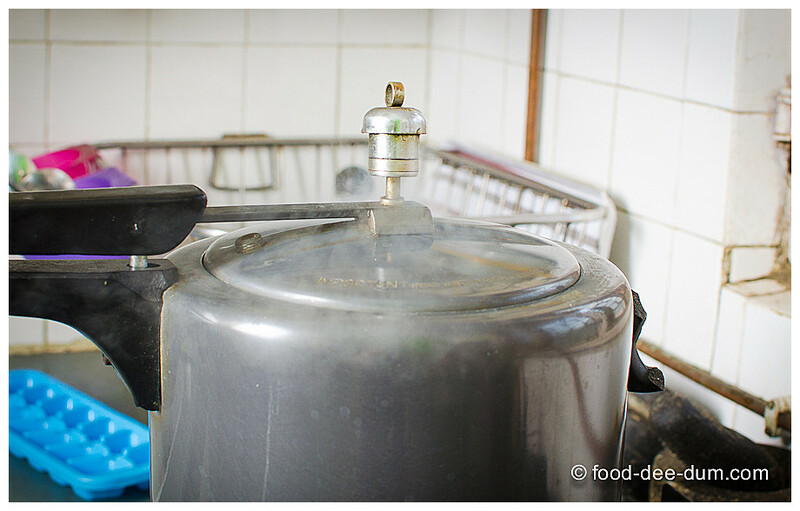 After turning off the stove, I allowed the pressure and steam to release naturally. Then I opened it up and allowed the contents to cool until they were handle-able. See how the contents have reduced to less than 1/3 of their volume! AK thought I was crazy when I was cleaning and chopping the greens, wondering who would eat so much “icky-green-stuff”! 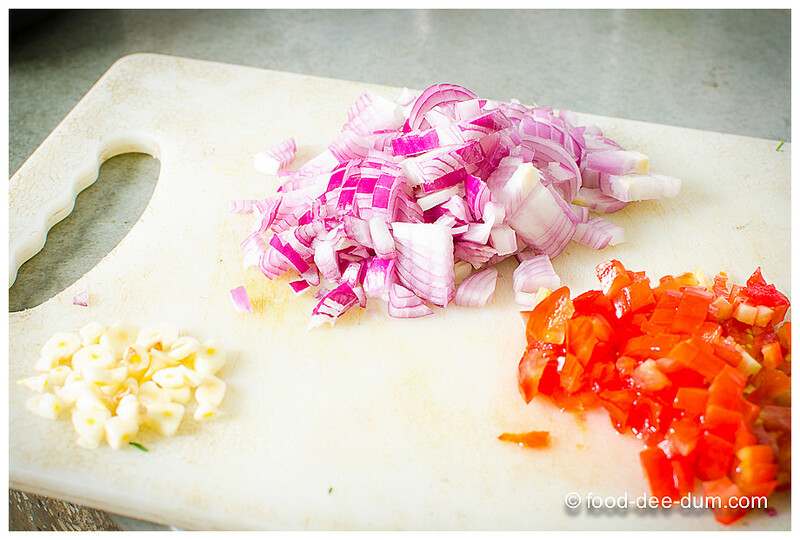 While waiting for the greens to cool, I chopped up the tempering ingredients – onions, tomatoes and garlic. Once the greens were cool enough to handle, I transferred them to the grinder jar of my mixie and pulsed it till it formed a very coarse puree, using very little water (that too, the cooking liquid from the pressure cooker. You can save the rest for the cooking time later). In earlier times, the greens were mashed either by hand or using a sil-batta (much larger format of the stone mortar-pestle) to maintain the coarse texture. But that’s just too much effort for me! 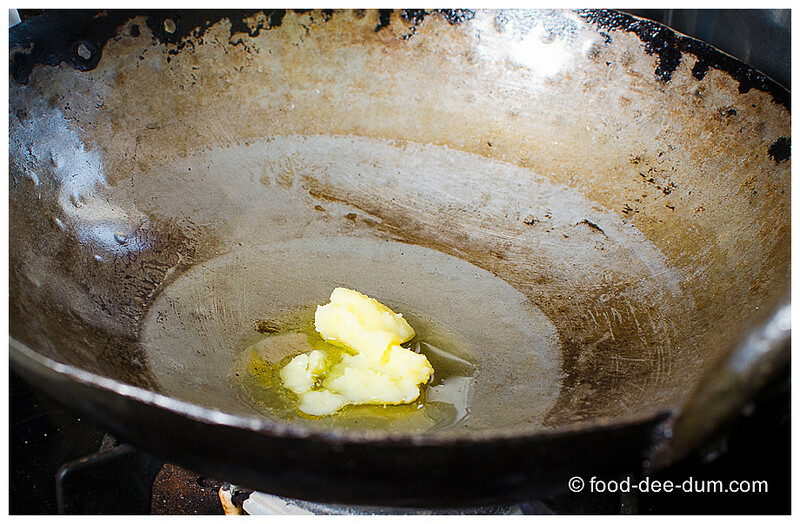 I placed the ghee in my iron kadhai (wok) and placed it on medium heat till it melted. 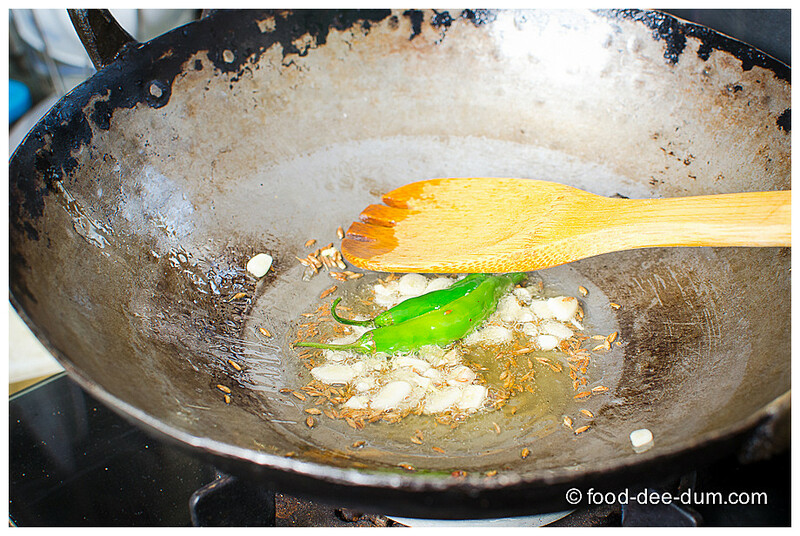 Adding the jeera and green chillies, I let them sputter madly before adding the chopped garlic for about 30 secs. 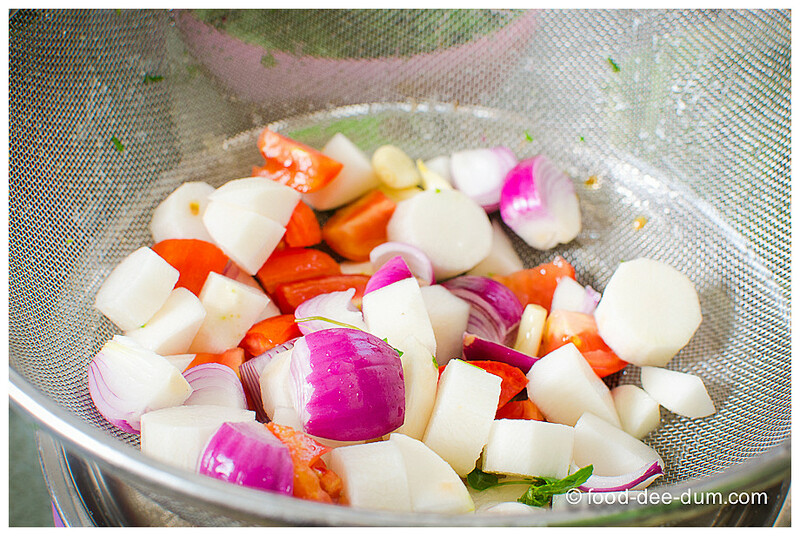 I followed this up with the onions and fried them for 3-4 minutes, until pale and translucent. 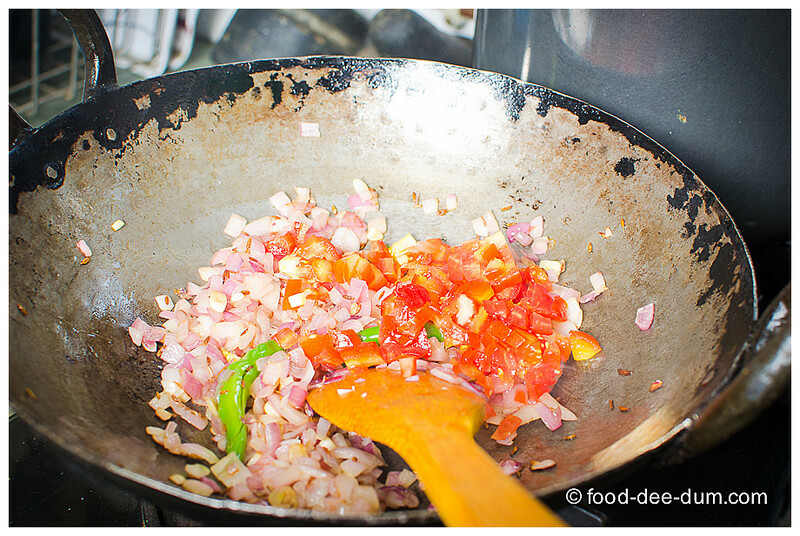 Next came the tomatoes, fried for another 3-4 mins until soft and mushy. 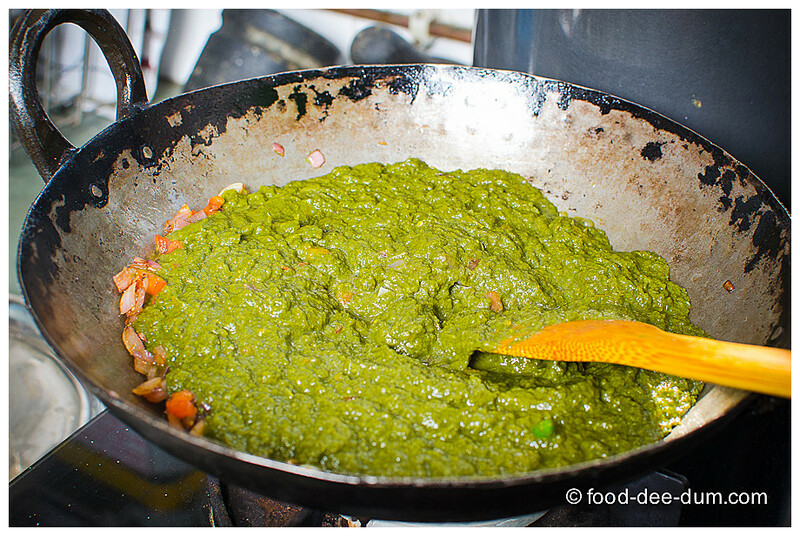 Adding a pinch of heeng, I gave it another 30 secs before adding in the green puree along with the reserved liquid. 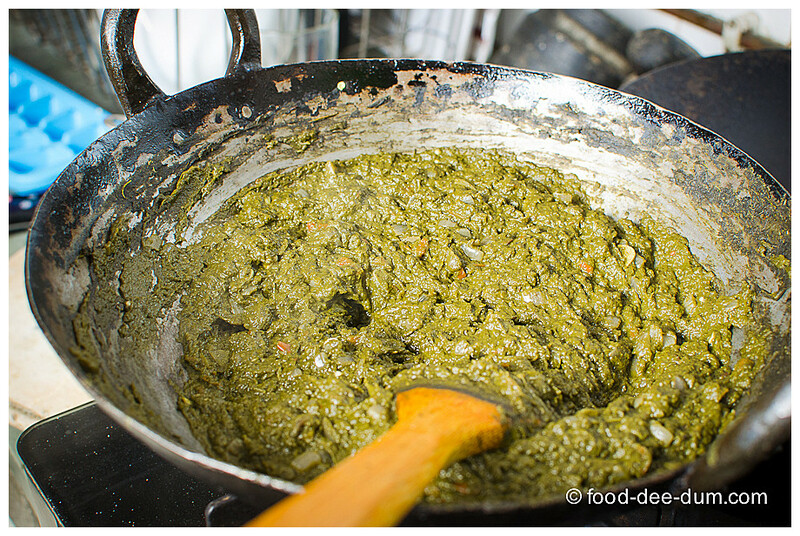 Reducing the heat to low, I cooked the saag slowly till it reduced in half and turned a few shades darker, about 40 minutes. Remember to stir occasionally to avoid sticking/ burning. Taste for salt and adjust, if required. You can easily do this on high heat, stirring furiously, but the slow cooked kind tastes better. You should do what works for you — time and effort wise! 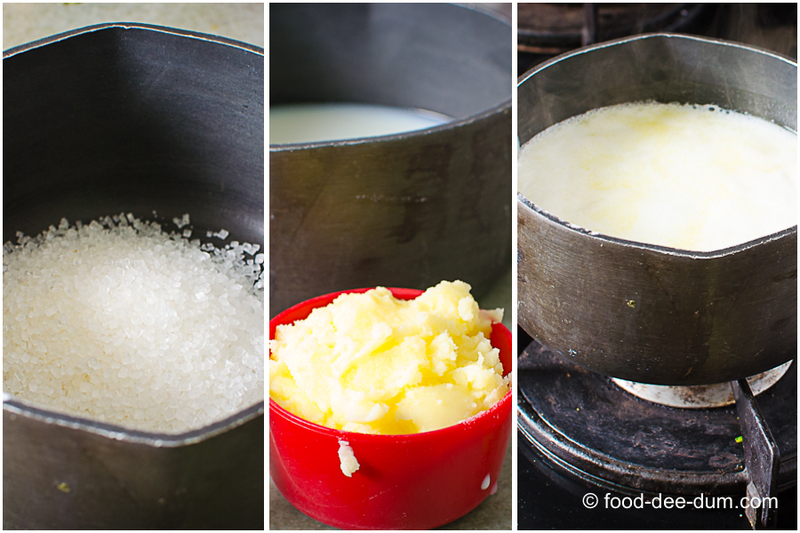 For the rotis, I placed the ghee, sugar, milk and water in a saucepan and set them on high heat until the mixture came to a boil. Taking the mixture off the stove, I allowed it to cool to room temperature and then transferred it to a wide bowl in which I could knead the dough. 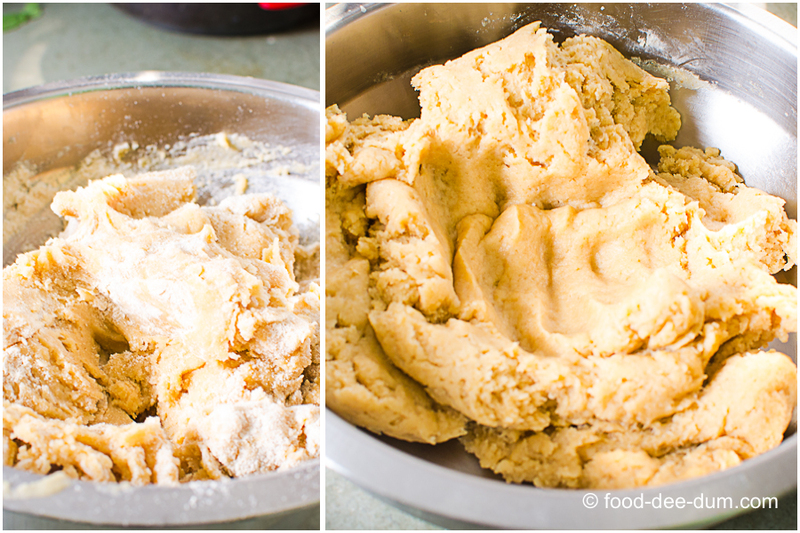 I added atta slowly, first by the cup-ful and then lesser amounts until the dough came together. It should be soft and moist but will never be smooth all over. 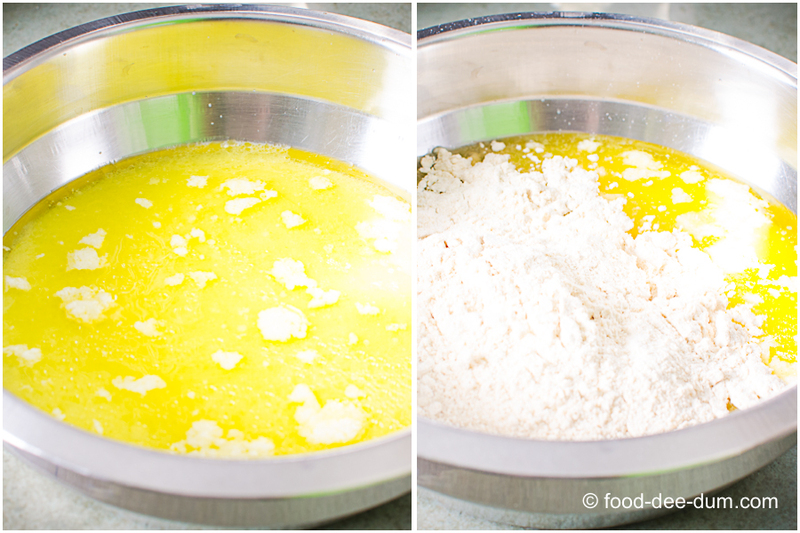 It will only be smooth where you press down on it or roll it – kind of like biscuit dough. See what I mean? It’s smooth right in the middle where I pressed down on it but slightly crumbly in other parts. It’s done! I collected it all in a rough disc and let it rest covered for about 15-20 mins. 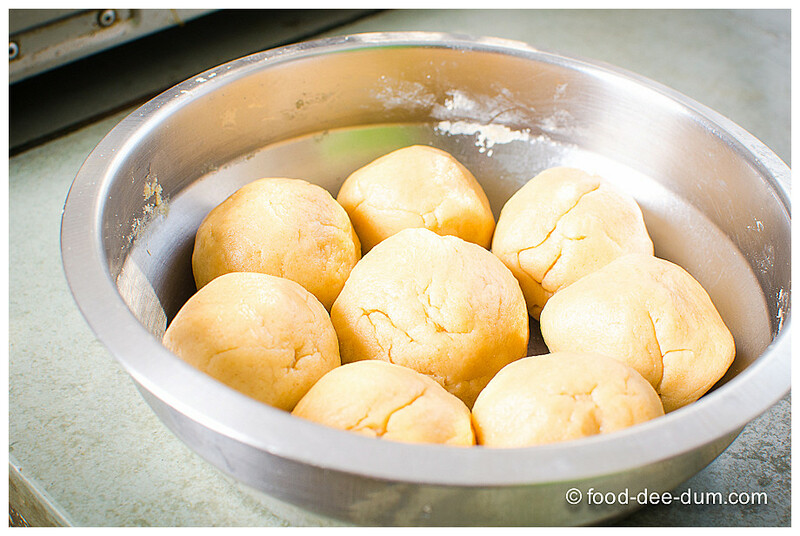 Then I divided it into 8 approximately equal portions and rolled them into balls and let them rest, covered, for another 10 minutes. 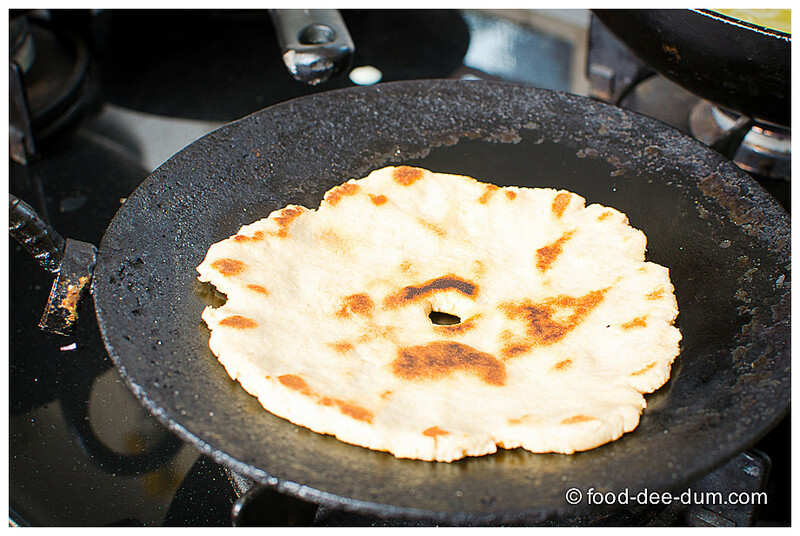 Setting a tawa (griddle) on low heat, I proceeded to tackle the dough 1 ball at a time! 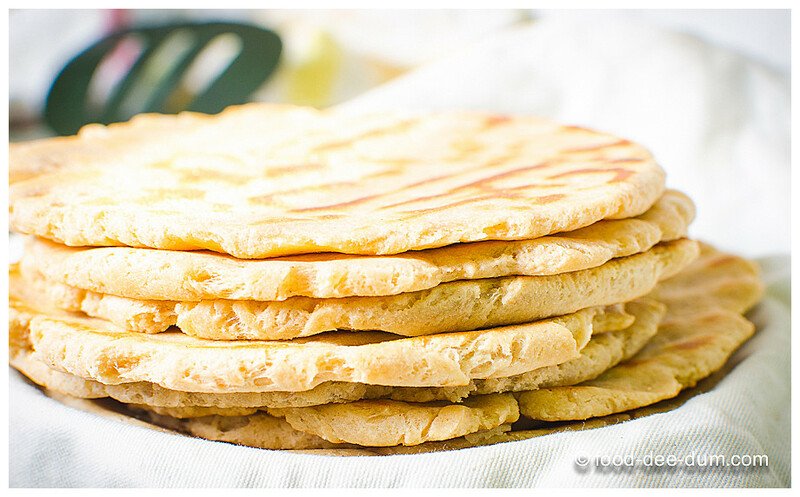 I pressed it out flat, using my fingers and heel of my hand rather than a rolling pin, into thick rotis about 6-7 inches in diameter. I cooked these on very low heat until done, approx 3-4 minutes on each side. Yes, I know it’s a very slow process. I actually used 2 tawas simultaneously to speed it up. 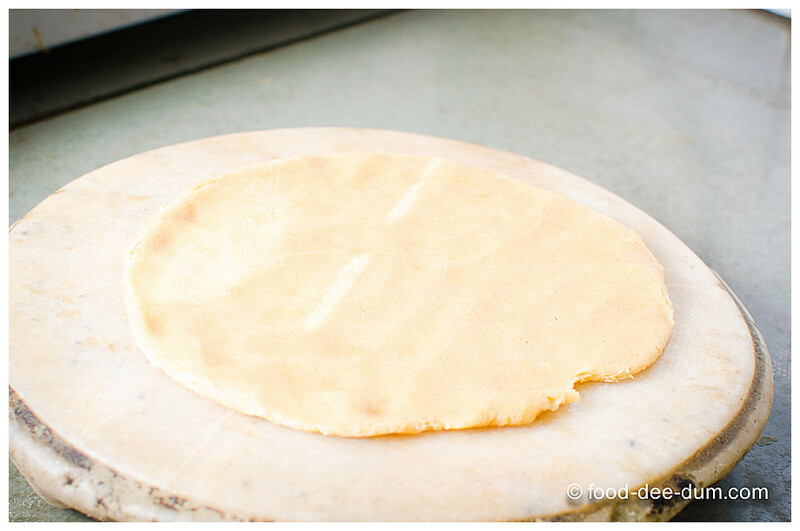 But make sure you roll out eat roti only when ready for the tawa — else let them rest covered to avoid drying out. This is my puja thali roti, which I managed to burn slightly on one side because I was multi-tasking unsuccessfully! Yes, it has a hole in the centre! Roti-with-a-hole as AK calles it — think Polo mint ads! 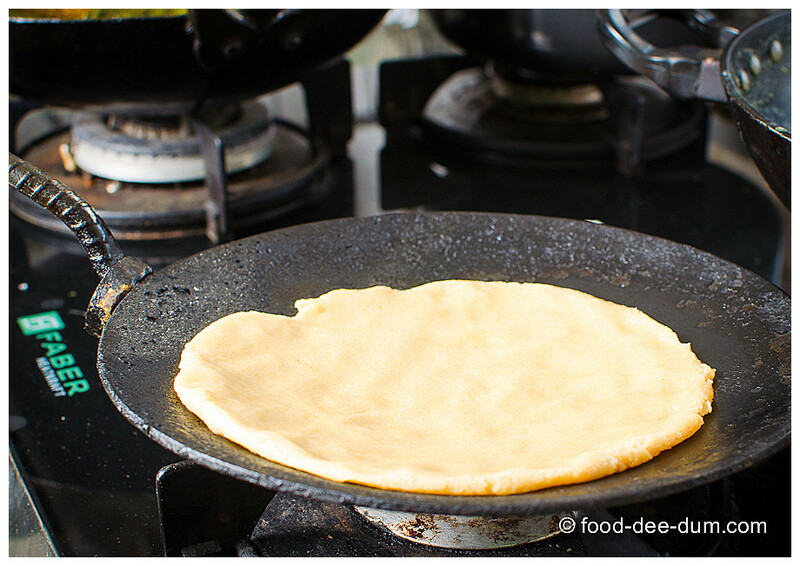 As you keep pulling each roti off the tawa, stack them neatly covered in a kitchen towel and lightly dab the top of each with a little ghee. Make sure you don’t leave them out in the open or they will dry and crisp up — literally like biscuits! See how pretty they are — rustic and wholesome. I love them to bits and am determined to do the biscuit version soon! 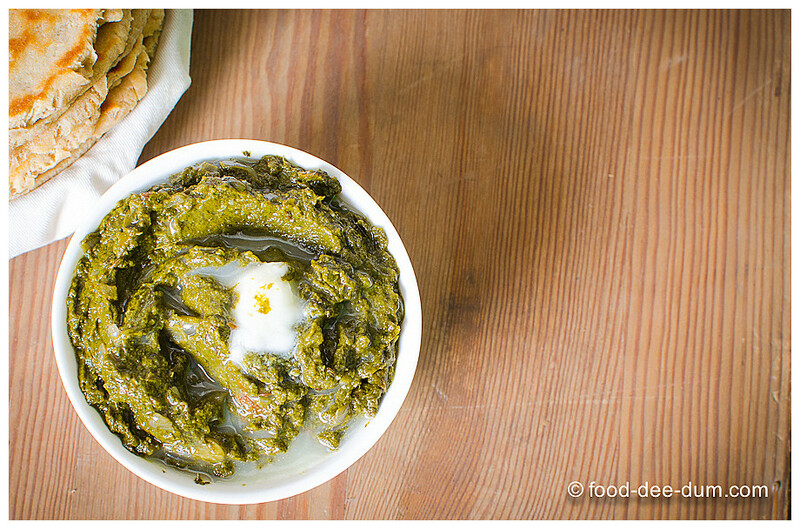 Serve these up with the saag and don’t make the monumental mistake of forgetting the blob of white butter! Ooh how I love that butter. Done! 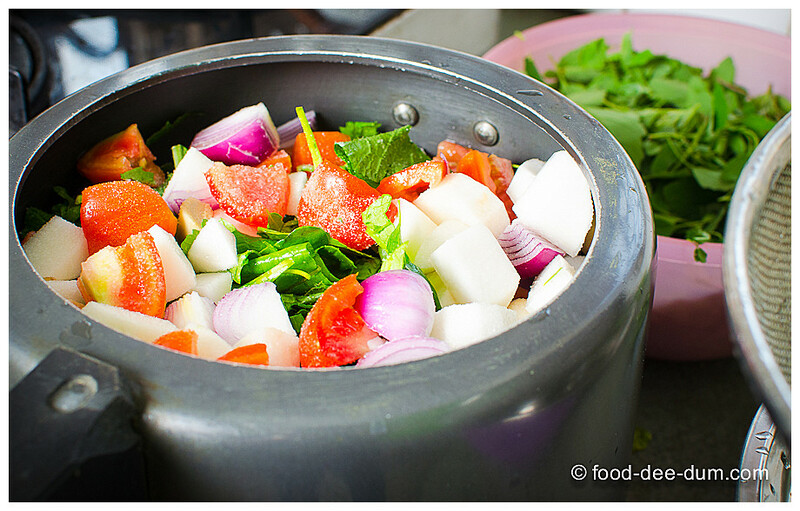 All the wholesome heartiness of a Delhi winter in a bowl! Also, if you can’t find bathua, don’t fret it and just use saag and paalak.